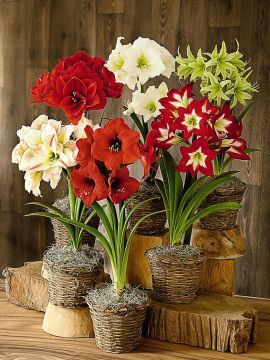 An Amaryllis Plant is native to the tropical regions of South America, and is a wonderful flowering houseplant to give as a gift for Christmas or Valentine’s Day. With the proper after- bloom care, an Amaryllis Plant will flower year after year between the months of December and June. Amaryllis Plant Bulbs can be purchased pre-planted, or you can buy the Amaryllis Plant Bulbs and do the planting yourself. The larger and fatter the Amaryllis Plant Bulbs, the more flowers an Amaryllis Plant produces. The brightly colored flowers of an Amaryllis Plant come in red, orange, white, pink, and salmon. Some new varieties of Amaryllis Plants may even have striped flowers. Both an Amaryllis Plant and an Amaryllis bulb are very poisonous, so please keep them away from children and pets. LIGHTING REQUIREMENTS: Amaryllis Plants need bright indirect light while growing. While a southern exposure is best for an Amaryllis Plant, western or eastern exposures are adequate. An Amaryllis Plant that only gets a northern exposure requires additional artificial light. 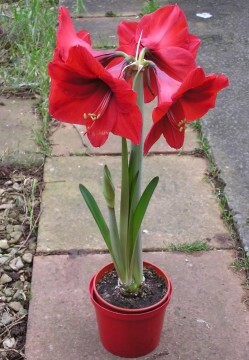 CARE INSTRUCTIONS WATER: Keep the soil of an Amaryllis Plant slightly moist but never soggy while the plant is growing. Increase the water you give to an Amaryllis Plant slightly once it blooms. The increase in water prolongs the life of the Amaryllis flowers. FERTILIZER: Fertilize an Amaryllis Plant monthly with a plant food high in potassium and phosphorus and low in nitrogen (5-10-10 or 6-12-12). Always dilute the plant food used on an Amaryllis Plant to 1/2 the recommended strength. TEMPERATURE: An Amaryllis Plant is a tropical plant and enjoys temperatures between 68-75 degrees. Once an Amaryllis Plant blooms, move it to a cooler area (65 degrees) so the Amaryllis flowers last longer. HUMIDITY: Basic household humidity or even less keeps an Amaryllis Plant healthy and free of fungal disease. FLOWERING: Plant Amaryllis Plant Bulbs any time from late fall to mid-spring using a good commercial soil. The bigger and fatter the Amaryllis Plant Bulbs are, the larger the flowers will be. Be sure to soak the base & roots of the Amaryllis Plant Bulbs in water for a few hours before planting them. PESTS: Thrip and spider mite infestations on Amaryllis Plants can be treated with the green solution (see Glossary) or you can use a commercial systemic insecticide approved for flowering plants. DISEASES: Amaryllis Plants develop blotchy leaves from various fungal and bacterial diseases. There is no good remedy for these plant infections, so isolate your Amaryllis Plant to prevent the diseases from spreading to your other plants. Plant diseases occur when houseplants are too kept close to each other or the leaves of the plants stay wet. To prevent plant diseases provide good air circulation and keep the plant leaves dry. SOIL: Plant Amaryllis Plant Bulbs in a good commercial bulb soil. If this type of soil is not available, plant your Amaryllis Plant Bulbs in a regular quick-draining, well-aerated, houseplant potting mixture. When using a basic potting soil for your Amaryllis Plant Bulbs, add some sand and humus to prevent the soil from becoming too heavy when wet.